Facebook is testing a feature it calls sidebar status in Taiwan and Australia, where short status updates from friends appear in the sidebar in its flagship applications for iOS and Android, but not in News Feed. The Verge broke the news about the test, saying that while the sidebar in Facebook’s mobile apps currently lists users’ most frequently messaged friends, users who are part of the test are seeing shorts status updates. According to The Verge, these updates can include small picture icons, and they expire in either 12 hours or when the friend who posted them posts a new one. The Verge added that these sidebar status updates feature the same options for privacy settings as other content on users’ profiles. People were having a difficult time staying in touch with their friends and seeing what they’re doing on a daily basis. Small things would make people feel connected in a big way. Now when I visit the sidebar, I can get an instant pulse of what all my friends are doing. 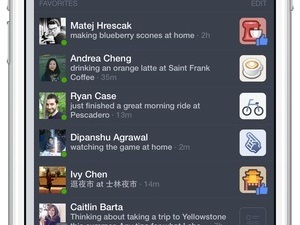 Readers: Would you like to see Facebook roll out this sidebar status feature?